So Sunday even ing trundles around again after another great weekend. Saturday didn’t quite pan out as planned during the day, but in the evening I went up to the Southbank in London to celebrate a friend’s 50th birthday. He’s also got a new flat and so it was a flat-warming too. 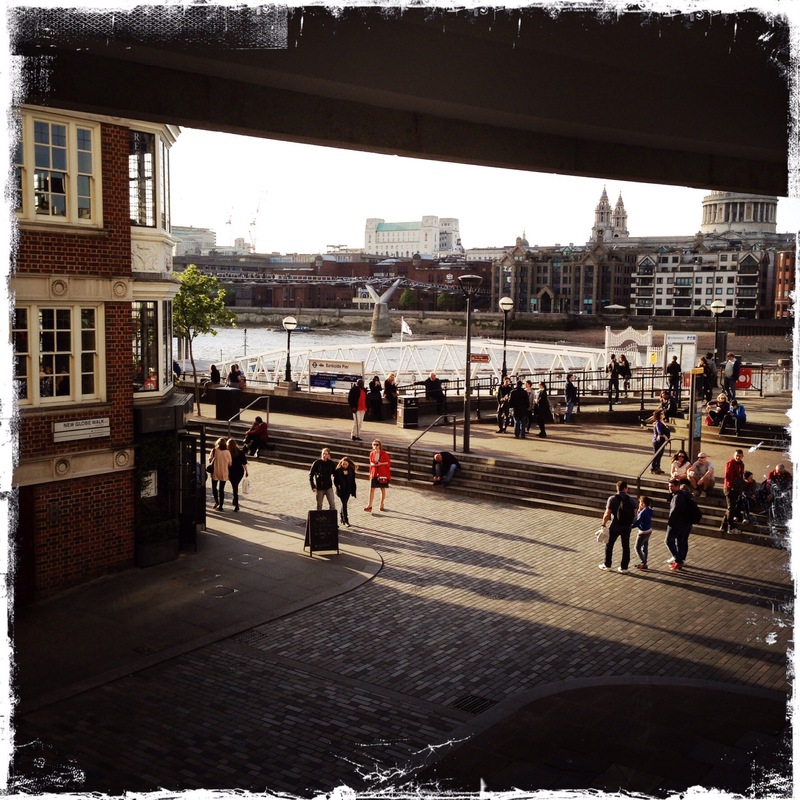 The photo is of the view from his lounge window – not bad seeing the Thames, St Paul’s and the Millennium Bridge. The Globe Theatre is just along out of sight. Twelve of us all descended upon his new pad – we kept the concierge busy – and then all clamoured for the guided tour before going out for dinner. It was lovely to catch up with a group of friends I hadn’t seen in a while [and also have a nose around a stupidly expensive apartment]. The group is mainly couples with only me and two of the guys still being single – they are both lovely and great company, but sadly we don’t see each other as anything other than friends. One of the girls there – who I hadn’t seen for a few years – is studying for a degree at the moment and was interrogating the three of us about our dating experiences, which got a little uncomfortable at times. On Friday I removed my profile from the subscription dating site as my membership had run out and I’m not prepared to pay again. I haven’t really had much success with it so far this year, so am taking a break. It’s not that I’m expecting things with CSG to turn into anything, but just want a bit of space from having to sell myself to strangers on-line, many of whom seem to have a very flexible relationship with the truth. Next weekend I’m going camping for the first time this year; a group of 10 of us (plus 3 kids) are off to Devon for a long weekend and I’m really looking forward to it. I spent a lot of today getting my camping gear out of the loft and making lists of what I need to take and buy. As usual the majority are couples, with only me and one of the guys being single. He’s one of the nicest guys you could ever meet – and really looks out for me when we’re all out as we are often thrown together being the singletons. But again, we don’t see each other as anything more than friends [story of my life!]. I think we’ve known each other too long, and know far too much about each other’s history for there ever to be any mystery. I know several girls in the group think it would be good if we got together, as it would tidy up us “loose ends”, but it’s highly unlikely. And CSG… well, I’m starting to question just what he’s up to. He mentioned on Wednesday evening when he texted me that he would “slide by” the next day to sort out a date for us to have a drink. I didn’t see or hear from him at all that day, and on Friday although he appeared a few times, there was no mention of drinks or dates. He was keen to show me his new Ted Baker tie though. He asked me what I was doing over the weekend; told him my plans for Saturday and that on Sunday I’d just be chilling out at home. He said he wasn’t doing anything at all, other than looking after his neighbour’s cat. I thought he’d suggest we got together, but no. On Saturday during the day I had been planning to go to my university annual reunion. It would have meant driving through where he lives to get there. We were talking about that on Friday, and it turns out he used to live on the same road as my uni, which was a bit random. We had a text exchange that evening – and I had a bit of dig about the lack of date arranging, which he ignored, but he did tell me to wave as I drove past his place in the morning, and gave a street name. I know the part of London he lives in pretty well, and the street he mentioned isn’t where he’s said previously that he lives. It’s not a million miles away from it but is in a less desirable area than where he’s said before his flat is. Not sure what that’s all about, but I’m rapidly losing patience. Also the job he’s after closes tonight, so it will be interesting to see whether he keeps up his desk-visiting schedule. I know I’m cynical and I over-analyse but I don’t want to find out I’ve been played. Hmmm. Time will tell.